To deploy an Azure template, you perform tasks in various stages: Build, Test, Copy to Azure (also called "Staging"), and Deploy Template. There are two different ways to deploy templates to Azure DevOps Services. Both methods provide the same results, so choose the one that best fits your workflow. 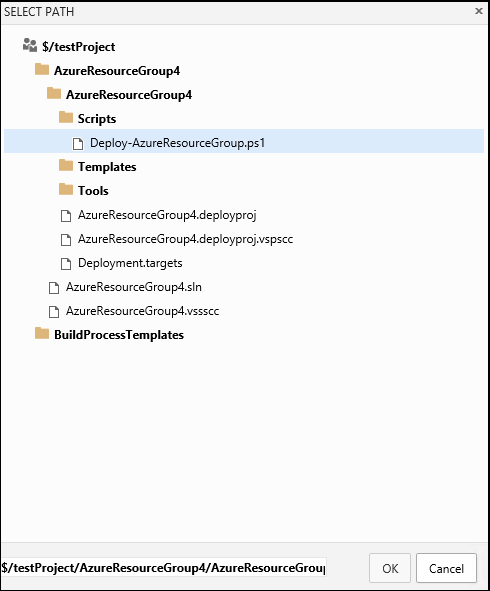 Add a single step to your build pipeline that runs the PowerShell script that’s included in the Azure Resource Group deployment project (Deploy-AzureResourceGroup.ps1). The script copies artifacts and then deploys the template. Add multiple Azure DevOps Services build steps, each one performing a stage task. This article demonstrates both options. The first option has the advantage of using the same script used by developers in Visual Studio and providing consistency throughout the lifecycle. The second option offers a convenient alternative to the built-in script. Both procedures assume you already have a Visual Studio deployment project checked into Azure DevOps Services. When you use the templates provided by Visual Studio (or built with Visual Studio snippets), the PowerShell script not only stages the artifacts, it also parameterizes the URI for the resources for different deployments. The script then copies the artifacts to a secure container in Azure, creates a SaS token for that container, and then passes that information on to the template deployment. See Create a template deployment to learn more about nested templates. 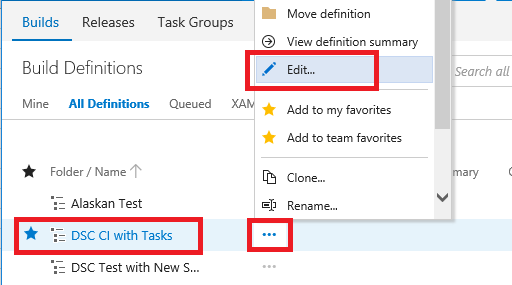 When using tasks in Azure DevOps Services, you must select the appropriate tasks for your template deployment and if necessary, pass parameter values from the staging step to the template deployment. Set up Azure authorization in Azure Pipelines. 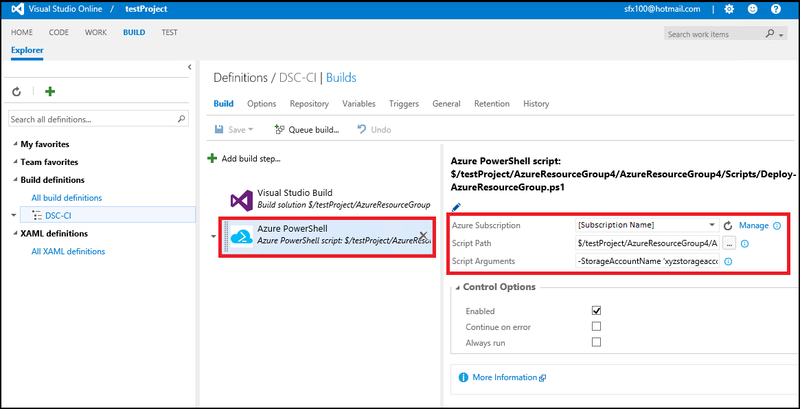 Add an Azure PowerShell build step that references the PowerShell script in the Azure Resource Group deployment project. Set the value of the -ArtifactsStagingDirectory parameter to work with a project built in Azure Pipelines. The following procedures walk you through the steps necessary to configure continuous deployment in Azure DevOps Services using a single task that runs the PowerShell script in your project. Edit your Azure DevOps Services build pipeline and add an Azure PowerShell build step. Choose the build pipeline under the Build pipelines category and then choose the Edit link. Add a new Azure PowerShell build step to the build pipeline and then choose the Add build step… button. Choose the Deploy task category, select the Azure PowerShell task, and then choose its Add button. Choose the Azure PowerShell build step and then fill in its values. If you already have an Azure service endpoint added to Azure DevOps Services, choose the subscription in the Azure Subscription drop-down list box and then skip to the next section. If you don’t have an Azure service endpoint in Azure DevOps Services, you need to add one. This subsection takes you through the process. If your Azure account uses a Microsoft account (such as Hotmail), you must take the following steps to get a Service Principal authentication. Choose the Manage link next to the Azure Subscription drop-down list box. Choose Azure in the New Service Endpoint drop-down list box. In the Add Azure Subscription dialog box, select the Service Principal option. Add a name of your choice to the Subscription name box. This value appears later in the Azure Subscription drop-down list in Azure DevOps Services. If you don’t know your Azure subscription ID, you can use one of the following commands to retrieve it. To get a Service Principal ID, Service Principal Key, and Tenant ID, follow the procedure in Create Active Directory application and service principal using portal or Authenticating a service principal with Azure Resource Manager. Add the Service Principal ID, Service Principal Key, and Tenant ID values to the Add Azure Subscription dialog box and then choose the OK button. You now have a valid Service Principal to use to run the Azure PowerShell script. Provide a path to the Deploy-AzureResourceGroup.ps1 PowerShell script. To do this, choose the ellipsis (…) button next to the Script Path box, navigate to the Deploy-AzureResourceGroup.ps1 PowerShell script in the Scripts folder of your project, select it, and then choose the OK button. After you select the script, update the path to the script so that it’s run from the Build.StagingDirectory (the same directory that ArtifactsLocation is set to). You can do this by adding “$(Build.StagingDirectory)/” to the beginning of the script path. In the Script Arguments box, enter the following parameters (in a single line). When you run the script in Visual Studio, you can see how VS uses the parameters in the Output window. You can use this as a starting point for setting the parameter values in your build step. -ResourceGroupLocation The geo-location value where the resource group is located, such as eastus or 'East US'. (Add single quotes if there's a space in the name.) See Azure Regions for more information. -ResourceGroupName The name of the resource group used for this deployment. -UploadArtifacts This parameter, when present, specifies that artifacts that need to be uploaded to Azure from the local system. You only need to set this switch if your template deployment requires extra artifacts that you want to stage using the PowerShell script (such as configuration scripts or nested templates). -StorageAccountName The name of the storage account used to stage artifacts for this deployment. This parameter is only used if you are staging artifacts for deployment. If this parameter is supplied, a new storage account is created if the script has not created one during a previous deployment. If the parameter is specified, the storage account must already exist. -StorageAccountResourceGroupName The name of the resource group associated with the storage account. This parameter is required only if you provide a value for the StorageAccountName parameter. -TemplateFile The path to the template file in the Azure Resource Group deployment project. To enhance flexibility, use a path for this parameter that is relative to the location of the PowerShell script instead of an absolute path. -TemplateParametersFile The path to the parameters file in the Azure Resource Group deployment project. To enhance flexibility, use a path for this parameter that is relative to the location of the PowerShell script instead of an absolute path. After you’ve added all the required items to the Azure PowerShell build step, choose the Queue build button to build the project. The Build screen shows the output from the PowerShell script. 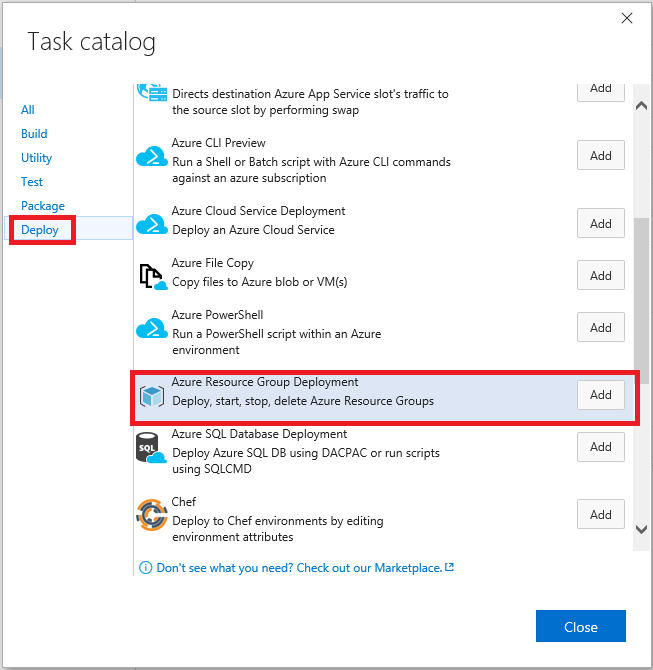 The following procedures walk you through the steps necessary to configure continuous deployment in Azure DevOps Services using the built-in tasks. Edit your Azure DevOps Services build pipeline to add two new build steps. 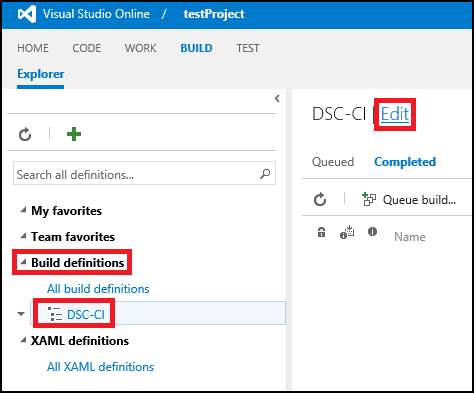 Choose the build pipeline under the Build definitions category and then choose the Edit link. 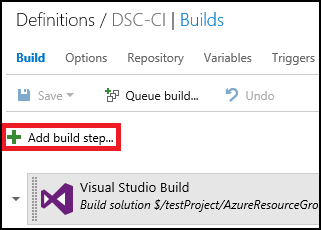 Add the new build steps to the build pipeline using the Add build step… button. 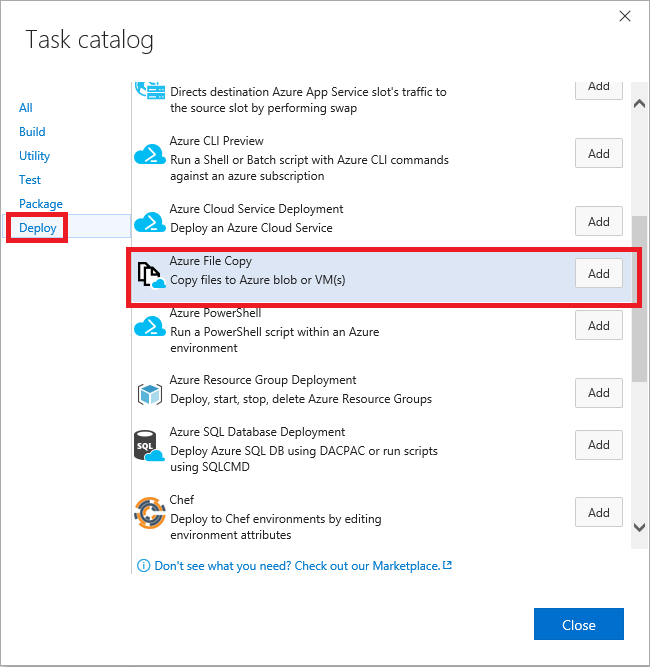 Choose the Deploy task category, select the Azure File Copy task, and then choose its Add button. 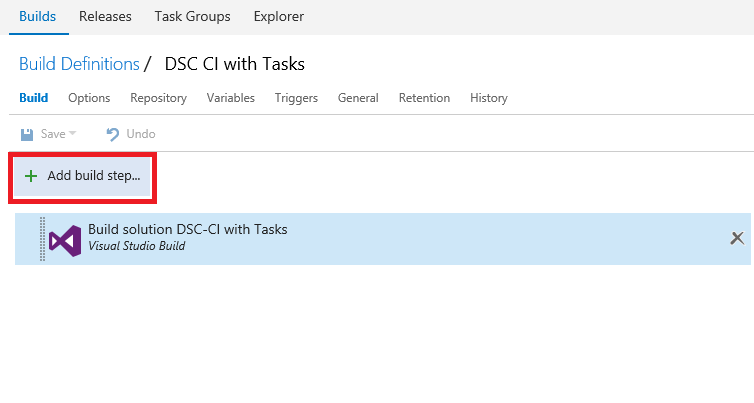 Choose the Azure Resource Group Deployment task, then choose its Add button and then Close the Task Catalog. 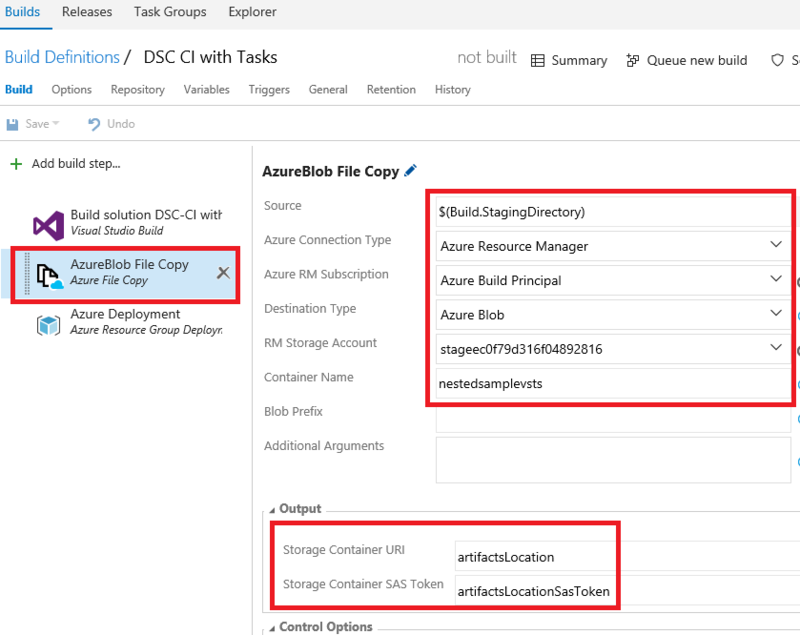 Choose the Azure File Copy task and fill in its values. If you already have an Azure service endpoint added to Azure DevOps Services, choose the subscription in the Azure Subscription drop-down list box. If you do not have a subscription, see Option 1 for instructions on setting one up in Azure DevOps Services. Azure RM Subscription - select the subscription for the storage account you want to use in the Azure Subscription drop-down list box. If the subscription doesn't appear, choose the Refresh button next the Manage link. 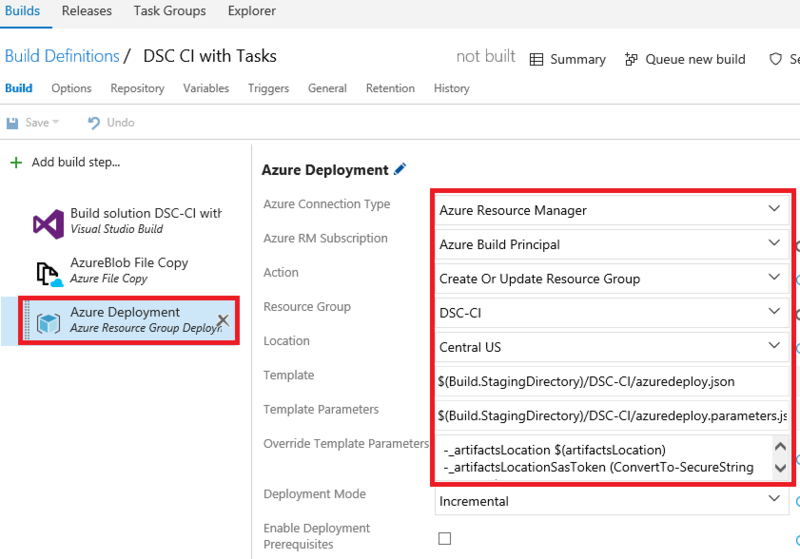 Choose the Azure Resource Group Deployment build step and then fill in its values. After you’ve added all the required items, save the build pipeline and choose Queue new build at the top. Read Azure Resource Manager overview to learn more about Azure Resource Manager and Azure resource groups.